Wouter's page : My "Apple ][" "Europlus"
My father bought us an "Apple ][", somewhere around 1980. A friend of his was involved with importing Apple clones from Taiwan. We started off without floppy drives -- I wrote a "breakout" lookalike in Integer Basic, which I eventually lost when the cassette I was using failed. Later we got floppies, as well as a Z80 softcard and 80 column card for running CP/M. Got my Apple up and running again. Had a dud RAM chip in the first bank. Found it with a logic probe -- D6 on the 6502 was not toggling while the rest of the data lines were, traced this through the buffers, keyboard MUX and latches to the RAM. My RAM is a motley collection of chips from all over. This one time, the motherboard fried, and they replaced half the chips, including about half the RAM. Also, some RAM chips blew before, and I replaced it with what I could find. So this time, I found my stash of 25 brand new 4164 64k x 1 chips. These have four times the capacity of the 4116 chips used in the Apple, and are 5V only parts (the 4116 needs -5V and +12V as well). http://arcarc.xmission.com/Tech/TECH_ Replacing 4116 RAM with 4164, 41256, etc_.txt. Subject: TECH: Replacing 4116  RAM with 4164, 41256, etc. to plug into the socket of the 4116.
as TMS4256, MCM6256, HM51256, MB81256, etc., 256k*1). address line to ground... you can't leave it floating). Juno First, and it works great. Runs much cooler!!! Soldering the wires is a little bit of work, but worth the effort. This works well, and I replaced the first two banks, giving me a "160k Apple(!)" (of which I can of course only use 64k :-) Will upgrade the third bank sometime as well. Bought one off eBay. The jumper block has three broken pins. 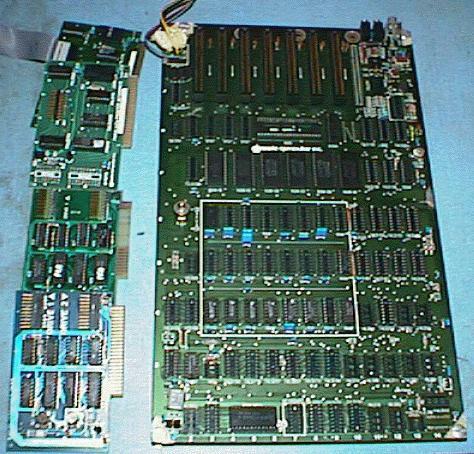 Apple II Super Serial Card jumper block wiring. (This is in the Super Serial Card Installation and Operating Manual, on the schematic page. Apple disk drives, controllers, and the IWM. There are many badly-scanned schematics for the analog board inside the Disk II. You will find a decent schematic here or in the DOS 3.2 Instruction and Reference Manual on Rich Cini's page -- note that this is the one with R28 = 9k1, other analog boards have R21 = 8k2 in series with a 10k pot R33 "Pulse Width Duration". Somewhere along the way I acquired a The Mill 6809 co-processor. 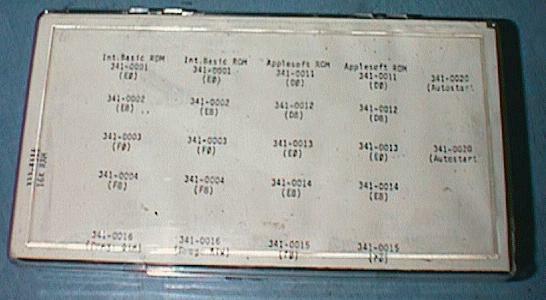 This is not the only 6809 co-processor for the Apple II, there was also the Seikou EXCEL-9, IBS AP-10 and maybe others. I bought a Catweasel back in 2005. As of 2015 it's still unused. I found some Wildcard PCBs on eBay. This is some kind of an SSTV system which sends black and white or colour (by scanning the same picture three times with different filters) pictures at a whopping 128 x 128 over a radio link. This cost $500 back in 1983, excluding the actual video camera. See this press release on page 98 of Ham Radio Magazine. The board I have looks like a clone. I doubt they would have sold a whole lot of them, but at $500 they would have been worth cloning! I scanned the circuit diagram (54K) that came with one of my floppy controller cards. A box of ROMs for servicing, pic1 and pic2. The Apple motherboard, FDC and printer cards. 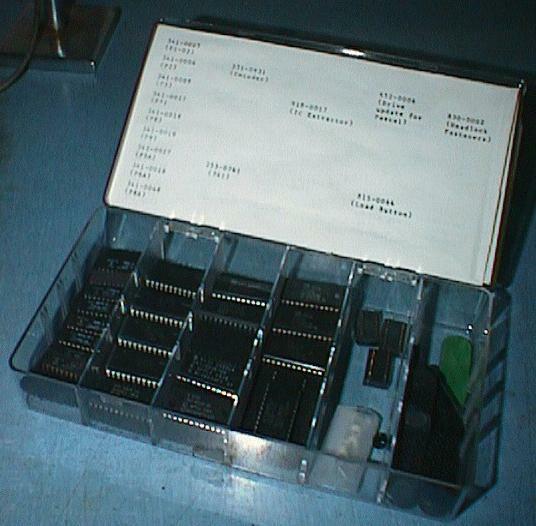 A UNITRON (clone) Z80 softcard. Paul R. Santa-Maria had a 6502 Firmware Page as well as info on the 68000 at Monroe Country Community College. When he passed away, this disappeared, but I managed to snag a copy from the Wayback Machine. Christer Ericson still has Krackowicz's Kracking Korner -- The basics of kracking parts 1-4 online but his homepage doesn't link to it. Local mirror, and of course Jason Scott has a more complete archive, an interview, and a whole lot more. Early Copy Protection on tapes. Andy Hertzfield and others are compiling anecdotes from life at Apple. Remember Bob Bishop? The Applevision dancing man? Dung Beetles? He had a web page on Geocities (which closed) but now has a web page here (RIP Bob Bishop, September 2014). Bob Bishop also taught us how to do the Apple split. The USENET Apple II FAQ. I've been looking for Beneath Apple Manor for a long time. Finally found it at http://www.abandonwarering.com/tiktok/ but Tik Tok did not stay up long. apple2.org.za has mirrors of many Apple sites.